I left you and London for Istanbul to live my own life. It was the perfect place to work and play hard. The AKP had been doing well despite our concerns about its Islamist agenda and we finally had stability and order after all those chaotic years. 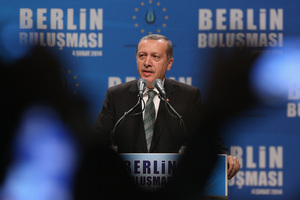 Yet, Prime Minister Erdogan began to get tougher as his popularity increased. Many people, including journalists and students, had been imprisoned purely for their political opinions. I didn’t mind; freedom had a price: keeping silent and minding your own business. Then came the 31st of May. A colleague asked me if I would join the protests to defend the trees in Gezi Park. I initially didn’t think it was worth it. After all, we remained silent over much graver injustices, so why bother now for a few trees? And yet, I agreed to accompany him. I felt taken back to my twenties; to the good old seventies when we’d protest for any reason. Bangs and flashes were coming from the police barricade as they tried to keep protesters away from the park. A sudden surge of movement and the police charged into the crowds, attacking us with tear gas. After many hours of struggle, the park was taken over by the protesters: the young people of your age; the so-called Facebook-Generation that we have constantly criticized for being too insensitive and apolitical. They turned the park into a festival of freedom and solidarity. The resistance then spread all over Turkey. The people, rich or poor, struggled heroically shoulder-to-shoulder against the excessive police brutality that eventually killed four people and severely injured many more. All they wanted was to protect their basic human rights from a man who bullies anybody who dares to criticize him. 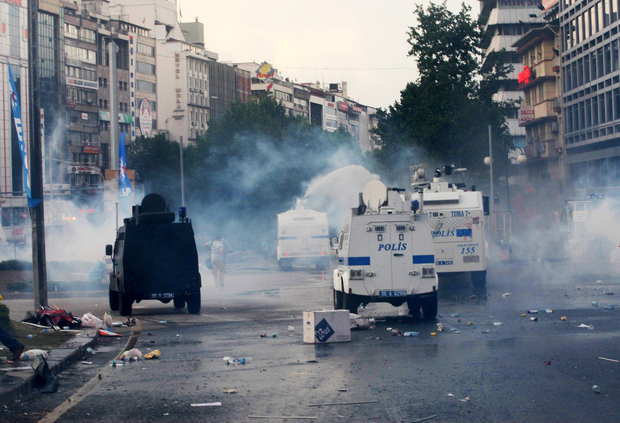 The festival came to an end when Erdogan commanded the police to take the park back from the protesters. I rushed to the park to defend it against the police, but I hesitated at the gates. “This is not my war,” I thought. 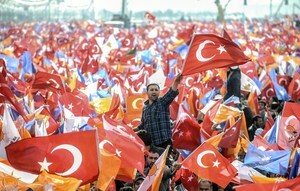 The AKP received 50% of the votes, so it’s easy to believe that the majority of the country is made from the same fabric as Erdogan and that the protesters are only a bunch of elitist rebels, fighting to defend their comfortable lifestyle. Perhaps those who claim that “Turkey’s past has little to offer in terms of democratic inspiration” were right; we don’t deserve democracy; we always have to make a choice between the so-called minority authoritarian secularism and majority Islamic totalitarianism. I am not convinced. This Oriental fantasy is far from what I’ve witnessed since my childhood. Ataturk’s republican principles were not patrician ideals imposed by the colonialists, but plebeian achievements adopted by a considerable part of society. Even Erdogan owes his position to these achievements. And this wasn’t the first popular movement either. To those who belittle the civil resistance tradition in Islamic societies, just look at the followers of Sheikh Bedreddin, who rebelled against the oppression of the Sultan and advocated sharing everything except the lips of the beloved. Yes, this is my war. I am as much a part of this country as those who voted for Erdogan. They didn’t vote for an authoritarian Islamist regime, but for stability and order. He promised you order, he promised you peace and all he demanded in return was your silent, obedient consent. Police drove us out with gas and plastic bullets. I took refuge in a nearby hotel. But we were not safe in there. The Police fired gas bombs inside; ignoring the fact that their use in confined spaces practically makes them a chemical weapon. In the end, we may have lost the park to the police but recently a court scraped Erdogan’s plan to redevelop Taksim Square. You see, courage and solidarity pay. However, a witch-hunt is going to start. According to a proceeding submitted to the prosecutors, international media, journalists, NGOs, football fan groups, artists, and marginal groups are claimed to be the organizers of a secret plot to illegally overthrow the government. Any critical voice – even this account – can now serve as evidence for an “act of conspiracy.” But we are not afraid. Taksim was just the beginning; we’ll keep on fighting. If one day you don’t get any news from me, please don’t be sorry, just take your friends and go to the streets and show solidarity with the people of Turkey who fight for the freedom to live their life the way they like. Do it whenever a despot attempts to shape the future of young people. Do it whenever corporate greed tries to steal the planet from future generations. Let it be with ideas, with ideology, with art, with faith, with politics; but do it. This is not a cry for help. Turkey is the future of Europe; so do it for the future of Europe. Taksim is everywhere and so must be solidarity. You don’t owe this to me but to the Turkish resistance, which has shown the world and me that freedom without solidarity is just silence, obedience, and cowardice. Not a life worth living. Read more in this debate: David Janssen, Buket Bora, Jonathan Wiltshire.